We want to talk more about media with our kids, but we’re not always sure how. 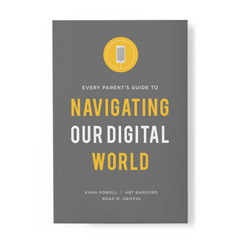 This post is part of a series celebrating our newest resource, Every Parent’s Guide to Navigating Our Digital World, which offers tools to help parents think differently about digital media, talk more about it together, and be inspired by the ideas of other parents navigating these same waters day after day. Join the community of families who are #navigatingdigitally. Video games regularly confound parents. We want to make good choices for our kids and help them make good choices for themselves, but the lines feel blurry and the options endless—especially with the ubiquity of gaming across console systems, computers, and mobile devices. Everywhere we turn, a new game is staring us down or lurking on the periphery of our homes and cars. Don’t live in fear or ignorance when it comes to gaming. Here’s a quick cheat sheet you can use, share, and employ the next time you’re faced with a new gaming decision in your family. 1. Researchers have helpfully identified three reasons people play digital games: to kill time, to hang out, and for recreation. Killing time refers to quick games kids play when they have a few minutes to spare between activities. Using a handheld game or puzzle to fill moments like this is certainly nothing new. For some, app-based games have replaced distractions like the Rubik’s Cubes of yesteryear. Hanging out is probably what most of us envision as the “typical” teen mode of gaming—playing games with friends and family as a way to relax and escape the stresses of everyday life. These categories offer helpful distinctions; if a person or group is looking for something to do and chooses to play video games, it is hanging out. If they specifically want to make time for playing video games, it is recreational. This does not make recreational gaming inherently bad, it just means this type of play has become a more intentional hobby. And hobbies become an important part of a young person’s identity. 2. Gaming has become pervasive enough that it brings some measure of the same social benefits young people find from other hobbies: practicing to master certain skills, feelings of achievement outside of the classroom, and respect from peers. A number of studies have also found that gaming has potential to be a healthy, positive recreational activity. Games have been found to improve perceptual skills, visual attention, and spatial skills, and they can be powerful learning tools. Contrary to how we often perceive gaming, it is not necessarily an inferior alternative to other activities like art, music, drama, or sports. Gaming has become an important and [mostly] healthy part of youth culture that can equip young people in distinct ways for future careers in fields like engineering, architecture, and information/technology. 3. Data suggests that the average teen in the US plays video games between 35 and 56 minutes per day, with a lot of variation based on age, gender, interest in gaming, and type of gaming (mobile, computer, or console). It’s not unusual for some teens to play two hours or more. 4. The amount of time spent gaming peaks between the ages of eight and thirteen and then tapers off for many young people. This doesn’t mean parents should cut kids off after their fourteenth birthday, but it may alleviate some of your concern to know that kids’ interest is likely to wane as they get older. 5. Gaming might be a problem when it becomes disruptive to other responsibilities such as homework and chores. If a young person begins skipping these other duties, it could be a sign that their gaming is becoming unhealthy. If kids are playing too often or for too long, but still managing to get their responsibilities taken care of, they may just need other recreational options. Talk with your kids about their interests, and then ask other parents or church leaders for some suggestions. 6. Taking breaks while playing is extremely important. Gamers can fall into a “flow” state comparable to gambling when they play for long periods of time. Some games have been designed to break this flow with timed levels and narrative sequences; others cater to it by offering endless, continuous action. And continuous-play gaming has now found its home on mobile phones, especially with games that have crossed over from console to mobile (like Fortnite). Extended gaming sessions of an hour or more should only be allowed if short breaks are taken frequently throughout. The way television shows are broken up might be a good rule of thumb: brief interruptions every fifteen minutes, a short break every thirty minutes, and a longer break after an hour. 7. There are now more adult gamers than ever before, which means there are more games made specifically for an adult audience. Keep track of the games your kids are playing to make sure the content is appropriate, just like you would for movies or music. We encourage you to check out the Entertainment Software Rating Board (ESRB) website: www.esrb.org. This organization is responsible for assigning video game ratings, and they offer a lot of great resources for parents. 8. Most video game consoles and devices have built-in features that allow parents to limit how long their children can play, restrict accessing the Internet through the system, and in some cases can even block games above a certain content rating (e.g., “T for Teen” or “M for Mature”). In addition to info on game ratings, the ESRB website can help you set these up. 9. A common trick young people pull is to ask extended family members and friends to give them games with higher ratings than appropriate for birthdays or as Christmas presents. If your kids have a generous grandmother or unassuming uncle from whom they typically receive gifts, make sure these folks know what your standards are and how to check ratings. 10. In our interviews with parents, several told us that their kids (sons in particular) would get extremely angry while playing certain games. While games can be a good cathartic outlet for adolescents, and part of what makes any game fun is yelling and getting excited when the action picks up, make sure this doesn’t get out of hand. Encourage kids to stop playing games that elicit intense anger and instead opt for others that are equally as fun and challenging. Some parents have noticed that games in which players are first-person-shooters are especially prone to producing excessive anger, so keep that in mind as you’re making gaming decisions as a family. Don’t let gaming game you. Be informed, and you’ll be empowered to meet the next gaming challenge in your home. BONUS: Print this “REQUEST FOR APP” worksheet and require your kids to complete it before you approve any new game! Mizuko Itō et al., Hanging Out, Messing Around, and Geeking Out: Kids Living and Learning With New Media. (Cambridge, MA: MIT Press, 2010). Lavinia McLean and Mark Griffiths, “The psychological effects of videogames on young people,” Aloma 31 (1): 19-133. See also Richard De Lisi and Jennifer L. Wolford, “Improving children’s mental rotation accuracy with computer game playing,” Journal of Genetic Psychology 163 (3): 272-282.; Jing Feng, Ian Spence, and Jay Pratt, “Playing an action video game reduces gender differences in spatial cognition,” Psychological Science 18 (10): 850-855; C. Shawn Green and Daphne Bavelier, “Action video games modify visual selective attention,” Nature 423 (May 29, 2003): 534- 537; C. Shawn Green and Daphne Bavelier, “Enumeration versus multiple object tracking: The case of action video game players,” Cognition 101 (August 2006): 217-245. The variation between young people is quite broad, and researchers struggle to define and measure gaming frequency because of its multiplatform reality. See Nielsen, “The Total Audience Report, Q1 2015,” and Common Sense Media, “The Common Sense Census: Media Use by Tweens and Teens,” 2015, https://www.commonsensemedia.org/sites/default/files/uploads/research/census_researchreport.pdf. Art Bamford is a Ph.D. student in Media Studies at the University of Colorado-Boulder. He completed an M.Div. at Fuller in 2015, and holds an M.A. in media and communication from the University of Denver where he worked as a research associate for the Estlow Center's Teens & New Media @ Home project. What is the real impact of violent video games?